Gold: How High is High? Your timing has been incredible. It is becoming clear that your forecasts are time and price which are separate. You have opened my eyes to a whole new way to observing the world. Do you think gold will still reach $5,000 after 2016? ANSWER: Yes, but as I have stated before, $5,000 is the extreme maximum target – not the minimum. I do not see any possibility of $30,000 or some other outrageous forecast. Even reaching $5,000 will not be easy, and we have to be concerned that they could simply declare gold illegal as they did in 1934. Government would not necessarily travel door to door to confiscate gold. Instead, they would are likely to employ the same tactic as used the past – outlawing transactions in gold to avoid taxes, which might even include Bitcoin. That would set the stage for the confiscation of any asset that avoids taxation, a crime they now call money laundering with a sentence of up to 20 years in prison. This is all about them – not you. They will never print their way out for their benefactors would not lend them money under that scenario. Hedge funds demand Draconian measures that a deflationary, as they are doing to Puerto Rico and Argentina. They do not care that society will not function under austerity because they want their profits. Such schemes against tax avoidance would not be merely a target against gold alone. It would be against anything taking place in a tax-exempt atmosphere. This posture would have the effect of shutting down gold futures, which would really screw the mines for they would be unable to hedge. Not to mention, if gold were illegal, who will buy the gold? So making gold illegal would result in a lot of problems. That does not put it past these people who may be trying some sort of scheme. However, this reflects the problems we face as government acts irrationally while trying to maintain control and power, rather than reform. This is the meltdown phase of governments for they cannot look at the long-term. There is no way out of this mess without a full-blown restructure, but that is a loss of power and they will never willingly do such a thing. They will kick and scream all the way. Gold should test the $2300 level, which is about the 1980 high adjusted for inflation. That target would appear to be the minimum. That requires, of course, maintaining a free market. We will not have the precise target for a high until we achieve the final low and see the Reversals generated from that low. So anything else is speculation rather than a forecast. We still expect the low to form on the Benchmarks as of now. Of course, the gold promoters will try to convince people that demand for physical gold will rise and that somehow will save the day. This is more of a sign that the low is not yet in place. What causes the rally from the low is its short-covering, NOT a rise in demand. Likewise, at the top, it is running out of fresh buyers who produce the high. You must exhaust the buyers to create the high and exhaust the shorts to create the low. I still recommend REAL gold coins – not bullion bars or restrikes. Keep away from rare dates and stay with common grade U.S. $20 gold pieces or $10 and $5. You want coins that can at least be considered a collector’s item. Stay far away from high grade and rare dates. 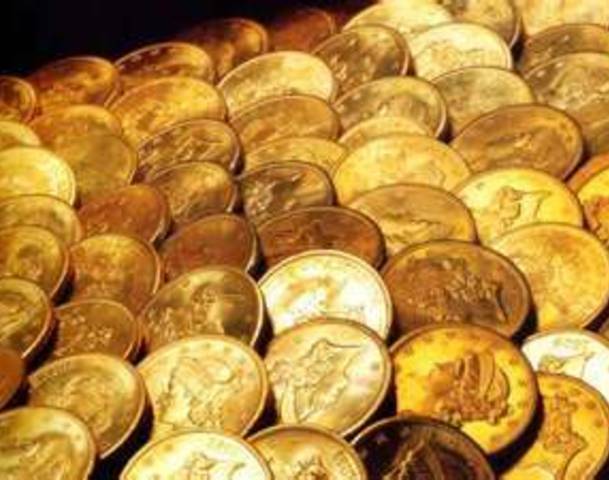 Also, be careful that the premium for newly minted gold coins, as well as silver, will rise as the price declines. This is people trying to make up for losses. Those premiums will decline at the top in prices and widen as prices decline.